Investigators looking into the Tuesday 19 hour terror attack at Dusit D2 Hotel complex suspect it could have been an inside job. According to a police officer who spoke to the Star anonymously, the attackers had stocked rounds of ammunition and grenades in one of the hotel rooms. The room, the officer divulged was bulletproof, something that slowed down the operation as it took them time to get in. This is where they found the commander of the team was hiding, he added. “It took us very long to break into the room because the armored door was very difficult to break. When we finally did, the commander, who was the last person to be killed, had so many grenades and rounds of ammunition in the room,” the officer stated. Officers believe that hotel employees could have facilitated the terrorists because some of the ammunition was found wrapped in hotel laundry bags. “We suspect an inside job considering these people had been frequenting the place as they schemed the attack,” the officer is quoted by the local daily. A couple of the upscale hotel staffers admitted to serving the attackers on several occasions before the attack. In fact, the police officer said, the commander knew the hotel really well. The felled terrorist attacker gave the police a hard time, he said. 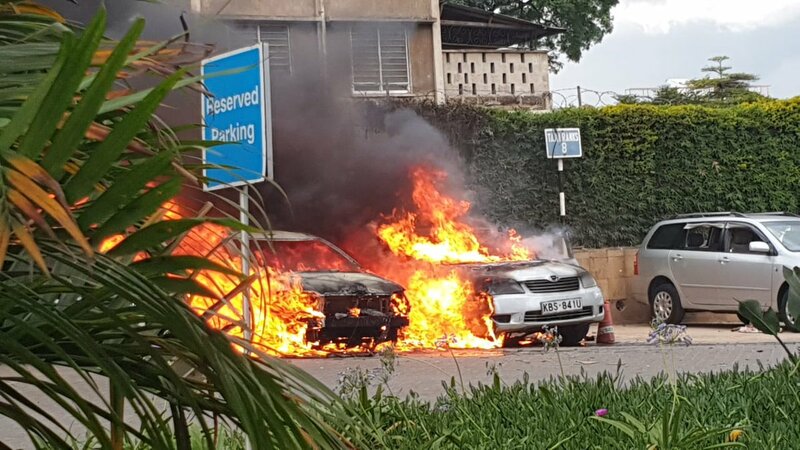 Five suspects believed to have been behind the 3 pm attack appeared in court on Friday and will be held for 30 days pending investigations. They are; Joel Ng’ang’a Wainaina, Oliver Kanyago Muthee, Gladys Kaari Justus, Guleid Abdihakim and Osman Ibrahim. DPP Noordin Haji has in place a team of prosecutors who will assist detectives probing the Riverside Drive attack. “I am satisfied that there is probable cause to continue with investigations against all the suspects. The investigations into this matter are complex and transnational and would therefore require sufficient time and resources to uncover the entire criminal syndicate,” he said.